National Engineering 2018 with the theme of “Engineering for Society"
The event offers access to the latest technology and innovations that are beneficial to participants, key prospects and people in the engineering-related fields. November 08-10, 2018 Time: 10:00-20:00 hrs. November 11, 2018 Time: 10:00-19:00 hrs. November 09-11, 2018 Time: 10:00-22:00 hrs. November 12-15, 2018 Time: 11:00-22:00 hrs. November 16-18, 2018 Time: 10:00-24:00 hrs. 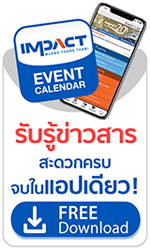 Home Product Center Public Co., Ltd.
A showcase of Thailand’s sporting industry, where local and international sporting equipment and accessories, and all sports related products and services of the largest quantities and of the most varieties, will be on sale. Products in this promotion will comprise of new product launches, special sale items, clearance items, and loss leader items. November 16-18, 2018 Time: 10:00-22:00 hrs. November 10-11, 2018 Time: 10:00-21:00 hrs. November 12-16, 2018 Time: 11:00-21:00 hrs. November 17-18, 2018 Time: 10:00-21:00 hrs.